Most reporting stations still have a west wind of 5-10 mph, but where the wind is near calm there is some frost. The sky is clear, and today will feature a sunny sky, but temperatures will remain well below average with a high between 56 and 59 degrees. SOME FROST EARLY TOMORROW: Tonight will be clear and cold with a light wind. Most of the larger cities will see a low between 38 and 42, but colder spots will drop down into the 30-36 degree range due to radiational cooling, with a chance of frost. Growers beware. Then, the day tomorrow will be sunny and warmer with a high back in the 70s. MID-WEEK FRONT: Wednesday will be warm with a high close to 80 degrees along with a partly sunny sky. A cold front will pass through Wednesday night, but moisture is very limited, and we will mention just a small risk of a shower Wednesday evening ahead of the front. Rain, if any, will be very light and spotty. Thursday and Friday will be sunny and cooler with highs generally in the low 70s. Friday morning will be another chilly one with most places reaching the low 40s; colder pockets could see 30s once again. 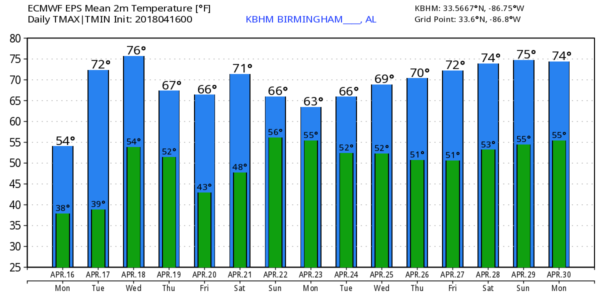 THE ALABAMA WEEKEND: Saturday looks like a nice spring day with ample sunshine along with a high in the mid 70s. Clouds roll in Saturday night, and Sunday will be wet with occasional rain and a few thunderstorms. Too early to determine if severe storms will be an issue; the American model (the GFS) shows the surface low a bit south of here, suggesting just a big rain event, while the European model (the ECMWF) shows the low near Memphis along with a chance of strong storms. We will have better resolution later this week. Rain amounts Sunday should be in the 1-2 inch range. NEXT WEEK: Rain ends early Monday, and the rest of the week looks dry and pleasant for now. See the Weather Xtreme video for maps, graphics, and more details. IT’S THAT TIME AGAIN!!! The Honda Indy Grand Prix of Alabama will be April 20-22 at the beautiful Barber Motorsports Park! Make plans for the event that has been voted “Best Annual Event” & “Best Sporting Event” in Birmingham. Kids 15 & under are admitted free with a ticketed adult, and three-day general admission tickets are $69. Single day tickets are $15. Pack a picnic/cooler and bring the family out for a weekend full of activities and racing! GET YOUR TICKETS HERE!!! We have a forecast page set up for it on the blog, click here to check it out. I have a weather program this morning at BB Comer Elementary in Sylacauga… look for the next Weather Xtreme video here by 4:00 this afternoon. Enjoy the day!